Dancers: Arcell Cabuag, Shayla Caldwell, Roderick Calloway, Valeriane Louisy Louis-Joseph, Onyxx Noel, Courtney Paige Ross, William Robertson, Annique Roberts, Dana Nichols, Keon Thoulouis. Several years ago we spent ten days in Senegal with the drummer Mamadou Diop and his students for an immersion in West African culture, music and dance. During an afternoon on the beach we encountered the rehearsal of a dance company. There were also drumming and dance concerts at an orphanage that Diop’s group has been supporting. A celebration was staged in honor of the desks for classrooms our group had funded. While an overall vocabulary of movement and rhythm was richly evident there was an emphasis on individual expression and improvisation. Given the overall form there was a lot of latitude and freedom. In the company of other drummers our teacher, Bey, would be inspired to bursts of furious intensity. There was a palpable competition as drummers and dancers took turns striving to excel and best each other. That was the spirit of legendary Congo Square in New Orleans in the era when jazz was born through a fusion of African drumming and European instruments. Having absorbed the source of West African culture it was revealing to see how it has been employed in the choreography of Roland K. Brown. He founded the Afrocentric company EVIDENCE in 1985. Compared to the freestyle improvisation of Senagalese dance he has created a fusion with other sources including club dancing, modernism, Carribean and Afro-fusion. For Come Ye there was a redish-orange back wall (designed by Brenda Gray). Ten dancers stood in silhouette seemingly absorbing a bluesy, slow ballad by the diva of jazz singers Nina Simone (1933-2003). With its emphasis on percussion the piece was unusual in her oeuvre for its African sensibility. More than roots she was reaching way back to the mother source. The ensemble gradually became activated with a slow, shuffling movement. There were several selections by one of the most notable protest artists of her generation. Like Billie Holiday’s “Strange Fruit” her “Mississippi Goddam,” at great personal risk to her career, became an anthem of social justice. She was known for being a demanding and difficult performer. Plagued with personal issues she was often at war with herself while defiantly challenging audiences. We hear her stop a performance to chastise the musicians, setting them straight then starting over on “Revolution” (1969). Brown has used this cleverly with a female dancer providing a provocative and amusing riff on her tirade which unfolds into an ensemble work. There is an upbeat, energized transition to the music of the Nigerian Fela Anikulapo Kuti (1938-1997). He was the focus of an award winning Broadway show Fela (2008) with choreography by Bill T. Jones. He was the best know, most controversial and influential African musician of his generation. There is a nice transition from Simone’s context of the struggle of Civil Rights to the repression, corruption, murder and mayhem embedded in the chant of Kuti. We hear glimpses of his house being torched and assaults on his mother. Onto this sequence is projected a short, documentary, montaged video by Robert Penn Warren. It is global in its reach of protests and assault with glimpses of human rights leaders from Martin Luther King, Jr. to Gandhi. While evocative it was obfuscating as one tried to view the images as well as follow the movement of a panoramic ensemble. 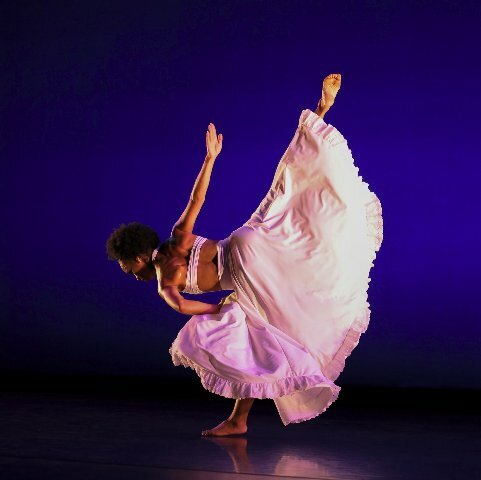 The excerpt for Dancing Spirit (2009-2018) presented the choreography of Brown in the context of the mainstream of African American dance. It evokes an iconic work “Cry” that featured the legendary Judith Jamison a dancer and choreographer for the Alvin Ailey American Dance Theatre. 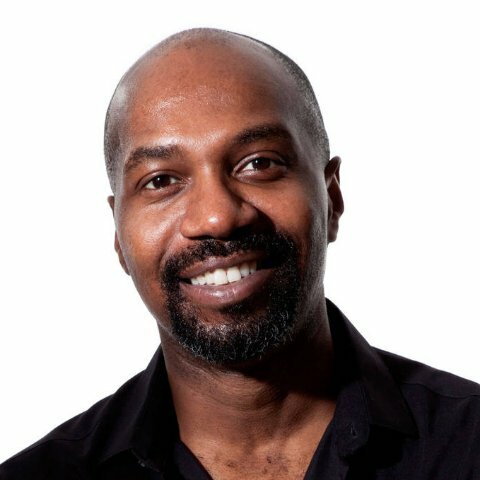 Brown’s piece was commissioned for the Ailey company but is now a part of his repertoire. To a staccato mélange of strings we encounter the singular presence of Annique Roberts in a layered white gown with full skirt and open back designed by Omotayo Wunmi Olaiya and recreated by Keiko Voltaire. Her stunning, legato movements evoke those of Jamison with a caveat. While Roberts is a woman of medium stature Jamison had the unique body of a giraffe or gazelle. It was her remarkable physical presence which made her dance so riveting. That said Roberts is a truly unique and wonderful dancer who fully inhabited and demanded our devoted attention. She was eventually joined for a romantic and evocative pas de deux. They were joined by other couples which bridged into ensemble work to the compulsive music of Radio Head. The second half of the performance featured New Conversations with choreography by Brown and music performed by Arturo O’Farrill & Resist. The musicans were grouped to the side in front of the stage. The ensemble included piano, percussion, brass/tuba, bass and flute. As its typical of O’Farrill it had an Afro-Cuban flavor with lyrical flute passages as well as the occasional, jarring, strange blast of tuba. It is always wonderful to hear live music at Pillow but also expensive and accordingly occasional. It was made possible by The Charles and Joan Gross Family Foundation which is unique for commissioning new music for dance. The piece was developed during a residence of musicians, choreographer and dancers at Pillow. A large ensemble work it evoked freestyle Senagalese dance at its most energetic, disciplined and exquisite. There were many crouching forms with a lot of upper body and shoulder movements. Arms were extended upward as though reaching for the gods in gestures of worship and supplication. With straight, vertical hands arms formed at right angles to the body sustained through exotic turns. The West African style entails the whole body in mobile configurations that contrast with the straight spine and vertical lines of classical Western dance. From the ensemble we were constantly riveted by individual style and riffs. At times some dancers appeared to be observing and approving the sequences of solos. Every dancer had ample opportunity to vogue their special moves. We were somewhat puzzled by the costumes of Keiko Voltaire. There were variations for both men and women of more traditional costumes as well as wild variations. A featured woman wore a skimpy silk top with open back. It floated provocatively over her torso. Some of the men wore patch work colored skirts. They reminded me of the kilts of ancient Egyptians. But I was lost in understanding what that signified. This was the first Pillow performance of the company in more than a decade.